After her husband died circa 1706, she moved to Norwich and operated a Tavern for several years. Sarah gave the Congregational church a silver goblet for communion and her assigned pew indicated her prominence in the community. In 1718, she was brought before the Justice of the Peace for illegally selling strong drinks to Native Americans. Sarah accused her maid, Ann Clark, of selling the liquor and “refusing to acquit themselves…they were each sentenced to pay a fine.” In 1722, she moved to New London to live with her widowed daughter and later died in 1727. In 1754, Joseph Peck owned the tavern and made many additions to the structure. Captain Arnold frequented Peck’s tavern and it was young Benedict’s job to haul his intoxicated father home amidst humiliating jeers from the townspeople. This experience contributed to Arnold’s life long hatred of alcohol. The scrolled cast iron fence is a late 19th century addition. The building is in the Colonial style, a center chimney plan added to on the right side. 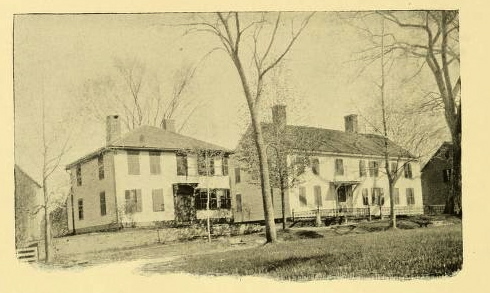 Azariah Lathrop bought the home from William Morgan in 1764 and enlarged or rebuilt it. Lathrop operated a prosperous tavern on the green. Card playing was illegal, so before Lathrop entered a room where he suspected guests engaging in the “forbidden amusement,” he would cough loudly, knock, and open the door with his back to the room so “he had never seen anything of the kind in his tavern.” Winter assemblies and performances were held in the tavern. Lathrop died in 1810 and left the house to his widow.